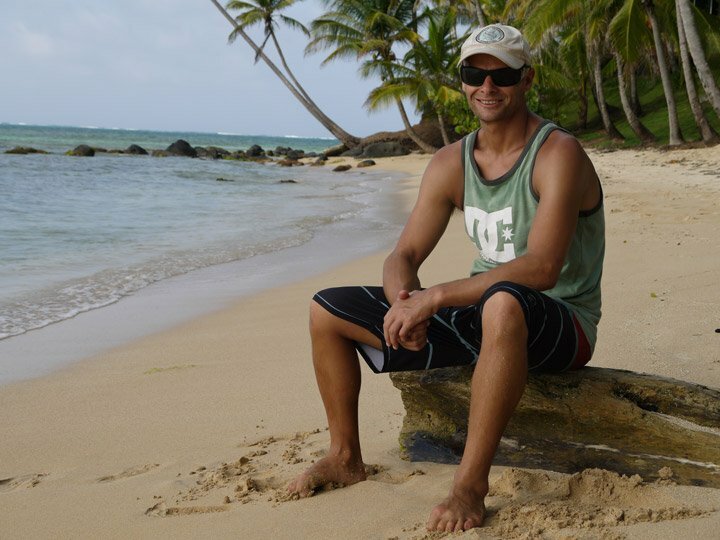 Ten amazing days on Little Corn Island, a lost little island of the Caribbean coast of Nicaragua. Life on the islands, things to do, diving and snorkeling, how to get there and budget. A week or two of traveling inland through Honduras and Nicaragua had us seriously missing the crystal clear, warm Caribbean water. This fire was fueled by tales from other travelers of a perfect little Caribbean island of the coast of Nicaragua, virgin beaches, no roads, no hotels, good diving and a jungle with mango and coconut covered floor. Traveling to Little Corn Island sounded like a mission, not something that thousands of suitcase dragging holiday makers would do, we were in. The trip from Granada was a long one including three buses and three boats, taking about twenty four hours. When we arrived we were a bit underwhelmed, maybe a bit irritated after the journey and a lack of sleep, but the sand was just not as white or the water as blue as expected, the non-stop rain did not help matters. The sun came out; we got some sleep, started exploring and had such a great time we stayed for ten days. Backpacking Little Corn is an awesome beach adventure! Little Corn island travel guide. Little Corn is tiny only about 1.5 sq km, you can walk across the island in about an hour. There are no vehicles other than bicycles and no roads, only a cement footpath running through the main part of the village passing the harbor and the handful of restaurants, dive shops, bars and some places to stay. We developed a daily routine, in the mornings walking to the beautiful Otto beach about 20 minutes north of the village for some snorkeling; to get here you cross a baseball field just north of the village and follow the dirt trail through the jungle. 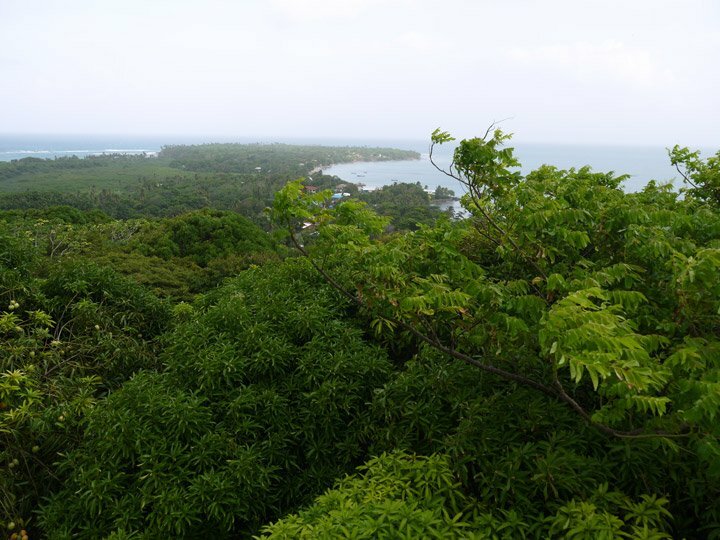 A view over Little Corn Island. The snorkeling was nice, the water is shallow and we never rented fins, using only our mask and snorkels. You enter the water in front of the stranded green boat on the beach that can be seen on the photo and swim over the sand and grass for about 200m to the gap in the reef, we saw a couple of nice size barracuda, a sting ray, a big pompano, trigger fish and some other small reef fish. There are some beautiful beaches on this side of the island. Taking the dirt trail back to town we usually picked up a couple of mangos and a coconut or two to go with lunch. A great discovery was Ester’s Bakery, I smelled the fresh baked bread before I saw the sign, Ester’s coconut bread is amazing and we took money to the beach every day to get fresh bread on the way back. Activities on Little Corn. Alya picking up some mangos on the way home. Coconut trees are all over the island, young coconut milk is great and we picked a few of these, chopping them open every day. We had a nice little island style party with some new friends when we added some rum to the chopped open coconuts. Avocado and pineapple trees grow over the island, but most are on private property, so if you see a house or shop close by, just ask if you can pick some. Avocados ripen of the tree, so wrap it in a paper bag and wait 3-6 days for them to ripen. There was a mini hippie community on the island, many of them staying in Three Brothers Hotel, they were doing fire shows, poi, teaching yoga and selling jewellery they made. It was great to get into some sort of training routine again and we went for a 30 to 40 minute barefoot run every night on the beach and the dirt trails, starting at Casa Iguana on the east side of the island, running over Cocal, Otto and Goat beaches, back over Goat beach following the jungle trail to the baseball field. The beach at the village was close for a swim after running or whenever we just wanted to go for a quick dip. Picking coconuts around the island. Activities on Little Corn. Alya picking up some mangos on the way home. Walk around the island, see my running route, there are many lizard and at night fire flies on the jungle trail. Dive, snorkel, swim, chill on the beach, collect good coconuts and mangos. 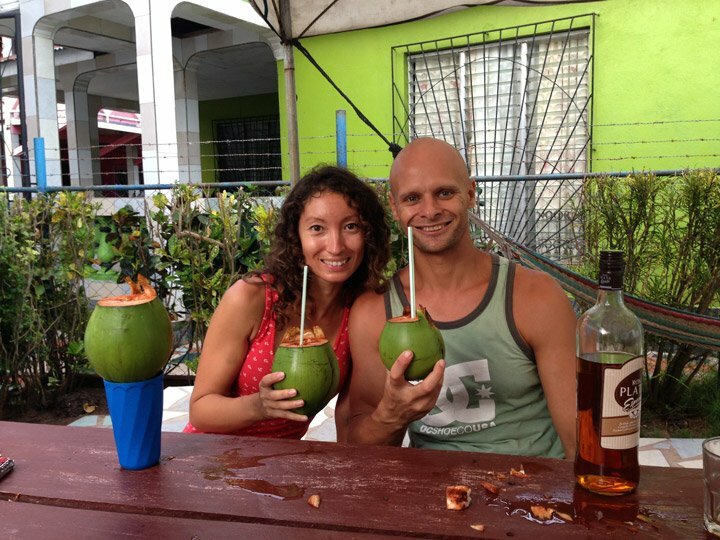 Go for a drink or a coffee in the village, spike coconuts with cheap local rum. Go and watch a baseball game on Saturdays. Do souvenir shopping from the nomad hippies selling jewellery. Don’t miss the viewpoint, an old cell phone tower at the lighthouse, you can see the whole island from the top. Do yoga in this beautiful jungle beach setting with firefly yoga studio or look for ads posted by travelling yogis. Go fishing with Elvis or Alfonso, just ask around in the village, there are Dorado, Barracuda and Jack fish to catch. Nightlife on the island. 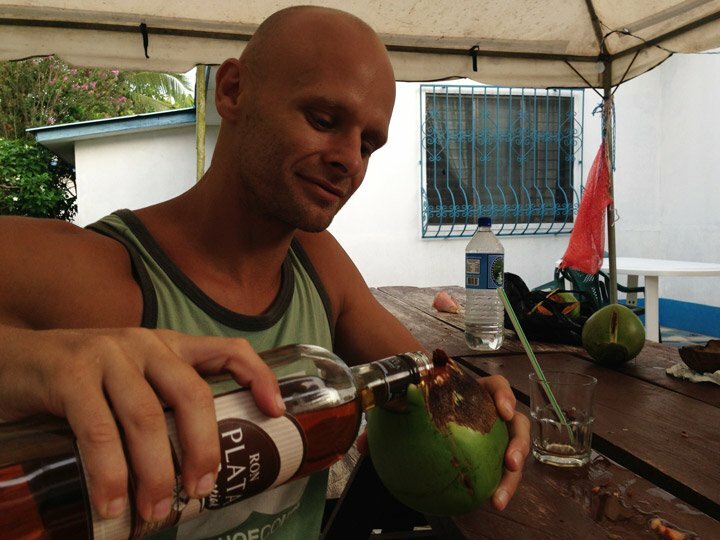 Drinking some local rum out coconuts. The corn islands are a well-known diving destination and a popular spot to do your open water course. I enjoyed the diving of little corn and did some dives with Dolphin dive, the dive center was great, very professional, good guides and the equipment is in good condition. The night dive was amazing; the bioluminescence was insane the best I have ever seen, the fluorescing plankton looked like stars in the sky making you feel like you are floating in outer space with the “strings of pearls”, rows and rows of bioluminescence being the highlight. We also saw a big Greater Barracuda on our safety stop drawn in by the torch light, shrimps, lobster, a hawksbill turtle and a variety of other marine life. The diving during the day was very nice but not spectacular; I would not travel here long distance only for the diving. We saw trigger fish, puffer fish, crabs, lobsters, shrimp, many nurse sharks and a variety of other marine life. If I travel solely for diving in Central America I would rather go to Roatan in Honduras or Xcalak in Mexico. We went snorkeling in front of this boat, unfortunately my camera broke while on the island, so no diving/snorkeling photos in this post. From the shore the snorkeling at Otto beach was nice; you swim across sand and grass for about 5 to 10 minutes before reaching the reef. Snorkeling gear can be rented all over the island and there are many boats taking guided snorkeling trips to further out sections of reef for about $20. You can also snorkel at night. We stayed in Three Brothers Hotel for $12 a night for a double room, it is one of a handful of places on the island were you have access to a kitchen. The rooms were clean, but we did have a cockroach or 3 chasing Alya around, the owner Randy gave us some bug spray that sorted out the problem. The kitchen is spacious, but has limited utensil, it would be handy to have your own knife, fork and spoon. Three Brothers is on the West side of the island in town very close to Pelican beach and a fifteen minute walk across the jungle to Otto beach. When you get of the boat there are signs to Three Brothers in town (just turn left). Some other budget options: The Lighthouse hotel, these cabins are brand new, close to the baseball field (cabin $15 per night), no kitchen. Graces Cool Spot, awesome colorful cabins on the beach, it is amazing spot and looks great (cabin $15 per night), no kitchen. If you walk towards Casa Iguana ($35) on the east side of the island, just after the turn off there is a local place with a dormitory on the right ($10 for a bed). We did grocery shopping in Granada for about C400 ($15) and took it with us, buying basics like coffee, rice, pasta, cereal, refried beans, tuna, salsa etc. this lasted us for about a week. 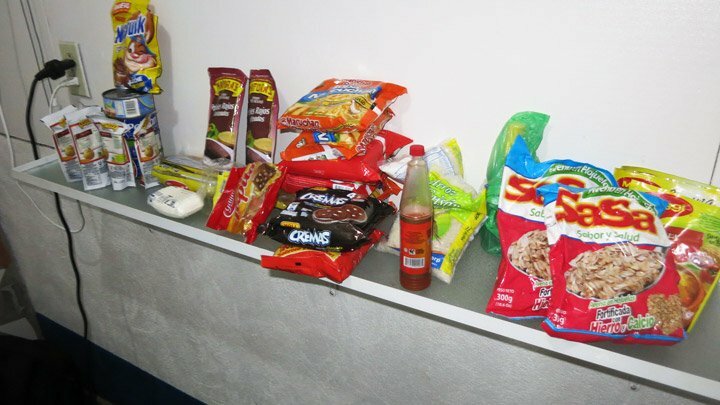 We supplemented this with fruit, eggs and coconut bread that we bought on the island. Some prices on Little Corn: Egg 6C ($0.2), Coconut bread 30C ($1), tomatoes 30C ($1) per libra, local white cheese 35C ($1.2) per libra. Most groceries are available on the island for about double the mainland price. Refill your water for free at Tranquilo (filtered water) even if you are not buying anything. Groceries for the week, shopping done in Granada for about C400 ($15). Tranquilo café and Café Desideri both have wi-fi and good coffee for about $1, at Café Desideri you get coffee in a French press. The meals at both places looked good (I never ate here) about $4 for breakfast and $6 to $12 for lunch or dinner. It was great to come here some mornings and read emails and drink coffee. Café Tranquilo has happy hour every night from 5pm to 7pm, cheaper beers and cocktails, they also have bonfires, fire shows, live music and quiz nights. There are two ways to get to Little Corn, there is an easy way and there is an interesting way. The easy way is flying from Managua to Big Corn followed by a speed boat from Big Corn to Little Corn. This route is followed mostly by holiday makers and the flight costs $180 return. The traveler alternative is a series of buses and boats that takes around 14 hours adding up to a total of about $60 return. Our ride on the cargo ship, The Islano D, was interesting it looked like a refugee boat going from Morocco to Italy, we sat on the floor the whole way, but the local people brought hammocks, doing it in style. Sitting on the deck, looking at the stars was great, but sitting got very uncomfortable. See my “Backpacker’s guide to get to the Corn Islands”. 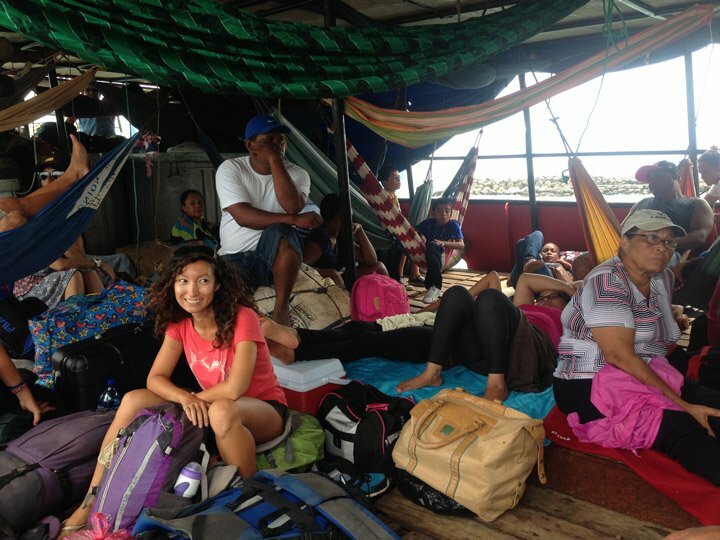 Sitting on the deck of our “refugee ship”, The Islano D going back to the mainland overnight. 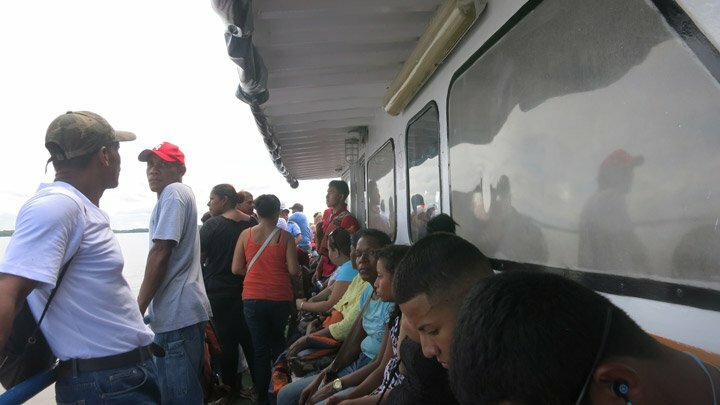 The ferry to Big Corn Island. 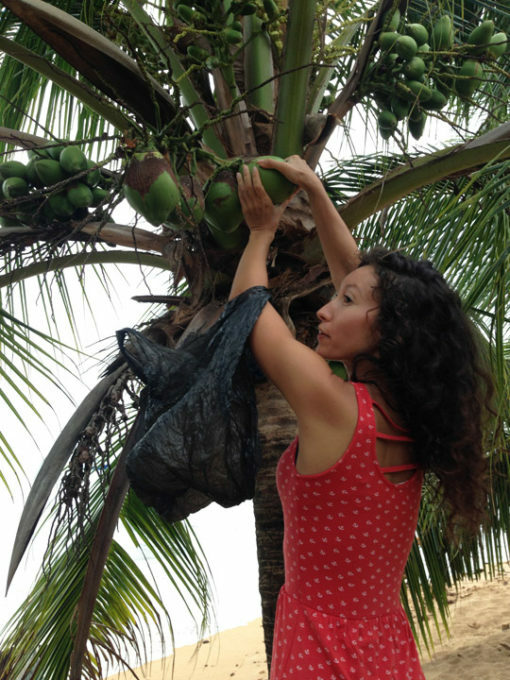 Harvesting coconuts on Little Corn Island. Alya walking on one of the many nice beaches surrounding Little Corn. We would love to hear from you, so don’t be shy to , share this post, comment give suggestions or ask questions! Hello, Jessie! Thank you so much! Our favourits in SA are Chile, Colombia and Peru. I think Chile is a bit out of your way. For your journey we’d suggest to go from Argentina through Bolivia and do Uyuni salt flats, it’s quite impressive. Then spend some time crossing Peru if you like mountains and hiking it’s an amazing country to do it, most hikes you can do on your own so it works out cheap. In Peru and Bolivia you can experience local culture they are both the most authentic countries in SA. Then go through Ecuador to Colombia. I liked Ecuador but it isn’t my favourit country in South America. There are some nice colonial towns (Cuenca), many volcanos and some beaches but if you go to the Caribbean I wouldn’t spend time for it in Ecuador. You probably won’t have time to go to the Amazon region in Peru or Colombia so you can visit some jungle in Ecuador, it’s easier to access. In these three countries it’s easy to stick to low budget. In Colombia there are so many things to see; mountains, jungle, colonial towns, beaches, great food and very nice people. It’s quite cheap as well except for transport long distance buses are more expensive than in Peru or Ecuador. In Central America we really liked Costa Rica for nature and animals it’s the best country, more expensive as well but if you don’t eat out and drink beer it’s possible to do it on a budget. By the way in your trip Argentina will be the most expensive country. Nicaragua was nice; Ometepe island is a good place to stop, Granada is a beautiful town and in Leon you can do volcano bording. 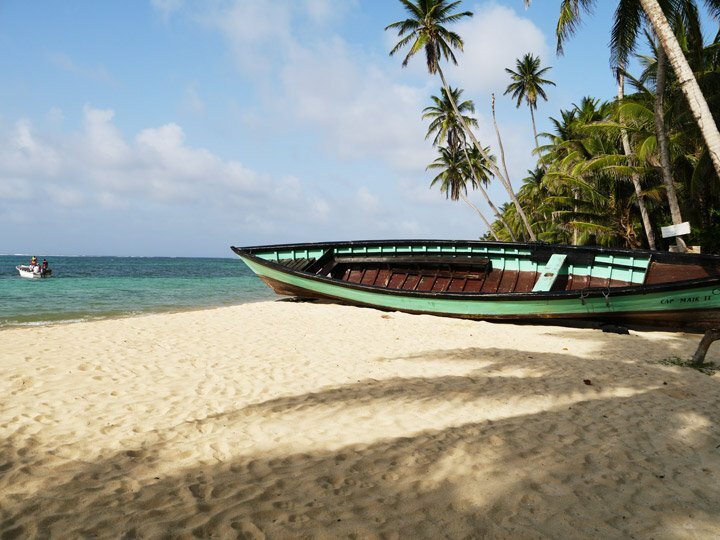 We really enjoyed Little Corn island but it’s a mission to get there I wouldn’t do it with only 6 weeks, at San Blas you’ll see nicer beaches. Guatemala is a very interesting country, very local, with some beautiful things to see, cheap fruit and actually everything is cheap there. We have entries on all the countries for more details you can check them. If you have more question we’ll be glad to help! Good luck! Hi Greg, we did not surf in Nicaragua, but I heard good things about San Juan. You don’t have a lot of time so I would say maximum two places. Moving by chicken bus is part of the experience, cheap and easy, but takes time. Leon has a very alive backpacker scene and the volcano boarding is fun. We liked Zopilote Hostel in Ometepe, my favorite place in Nicaragua (because of the hostel). Granada and Ometepe is a good combination, for a cool backpackers vibe and some activities Leon and Ometepe. Check out what other backpackers say about San Juan. Hello! 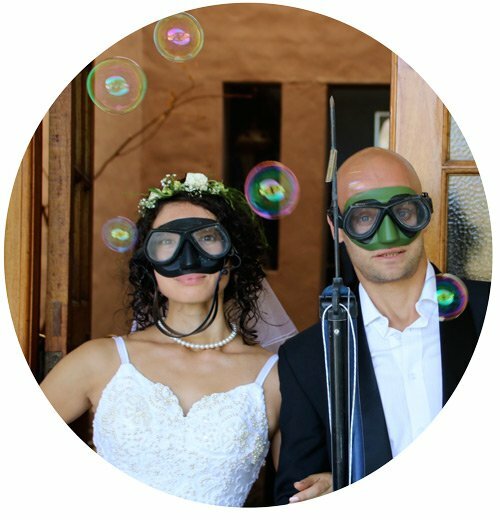 We’re Campbell and Alya, the creators of Stingy Nomads, water lovers and hiking addicts, traveling the world to bring you tips and tricks to experience some of the most thrilling adventures on the planet! We experienced everything on this blog and wrote every word. Get advice from a source you can trust. Want to know more ABOUT US ? We love keeping you guys up to date with what we are up to. We’re currently hiking in Annapurna region, Western Nepal. Disclosure: Stingy Nomads take part in the Amazon Services LLC Associates Program. We earn advertising fees by advertising and linking to Amazon.com. If you click on the link and purchase the item, we will receive an affiliate commission at no extra cost for you. Thank You!